I took this photo near our house the morning after last Thursday’s storm. It’s blue-ish because the sun hadn’t risen yet. That white mound in the center of the frame is a spruce, covered in snow and ice. As I write this, we are having another weather “event” with snow and possibly freezing rain and even rain, and there’s another one coming tomorrow. That said, it’s winter, so I expect these storms. I like to go outside when it lets up a bit and take photos of our dog running around. If you’re thinking, “Dirtynailz, don’t you have anything more profound and meaningful to write about?” Well no, actually, I don’t. 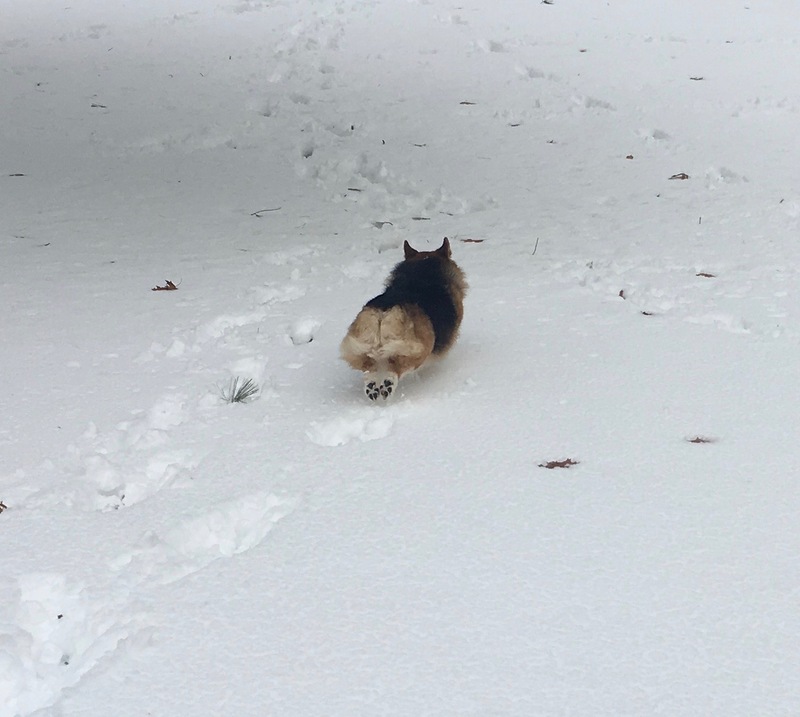 Watching her play in the snow makes it more enjoyable for me. 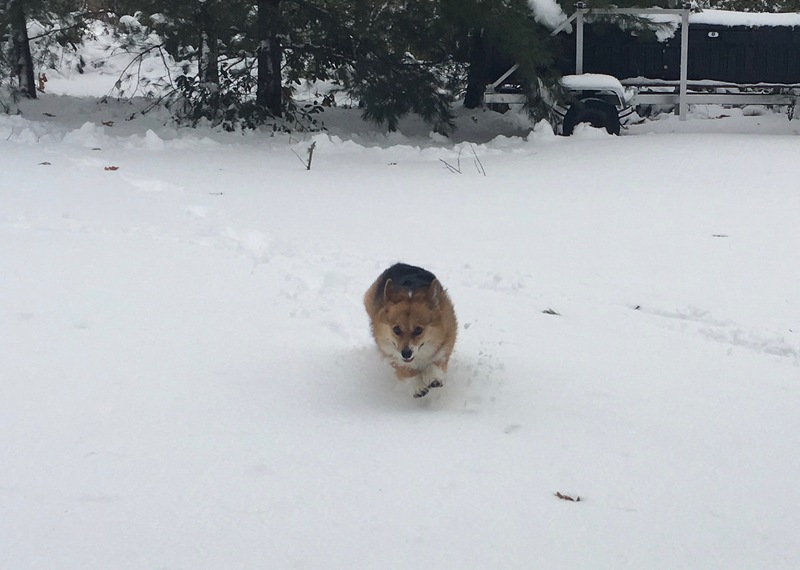 People who don’t know corgis always ask me how she can run so fast on those “short little legs.” Corgis were bred to herd cattle and therefore can walk or run for miles. They are badass. My dog needs a fair amount of exercise, and particularly enjoys off-leash opportunities to blow off steam. Who doesn’t? Here, she demonstrates perfect form, feet together and toes pointed. Ears are forward for a streamlined posture. I’d give her a 10. Blue-infused snow, whether it be in AM or at dusk, is miraculous and surprising – no matter how many times I experience it. Love your li’l pup and photos. 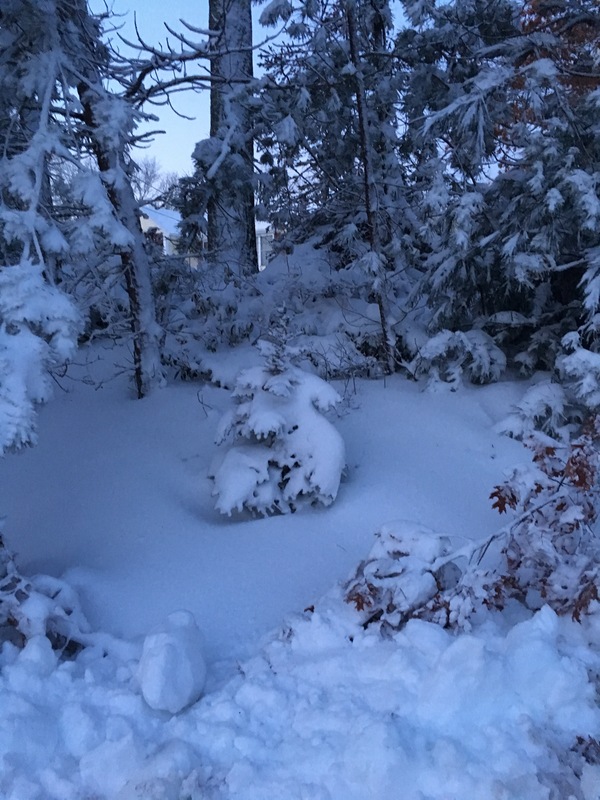 Maine is expected to get 2 feet today! Yikes. 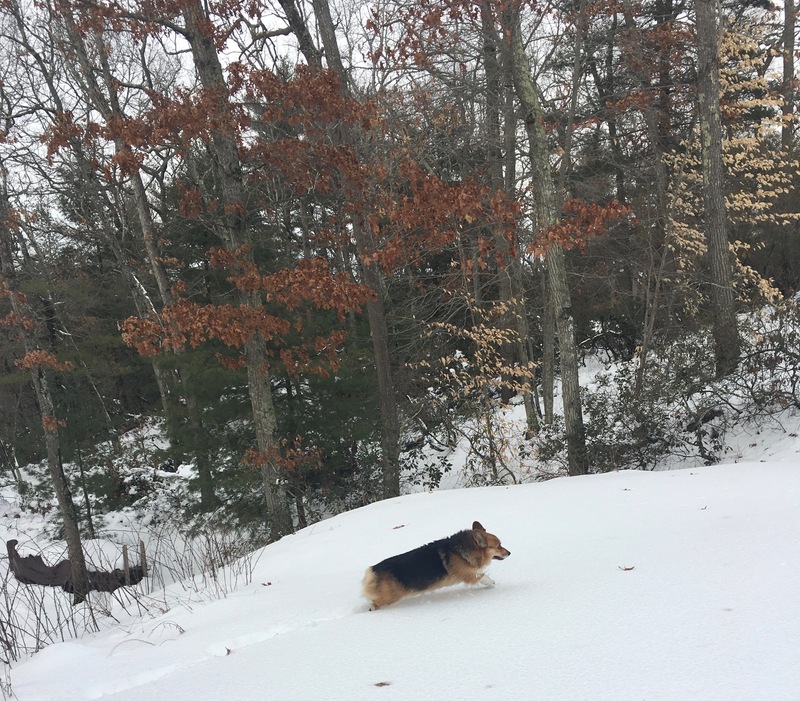 When I say that I love snow to locally grown folks here, they tell me I’m crazy but there are so many reasons I love it: beautiful soft blanket for earth (minimizes frost heaving); fun to frolic in – creating angels and fun to watch pets running in snow. Finally, without a snow cover here, our landscape looks bleak, just plain bleak at times. Have fun today, DN. I always enjoy your musings and pics. Thanks for your thoughts, GP. I too appreciate what snow does to protect the garden. We don’t get enough here. The pointy toes get thumbs up and a 10 from me, too! Lots more shoveling to do up here in Cumberland! Gardens very well protected. I appreciate the protection from the snow, too. I just hope it sticks around for more than a couple of days.